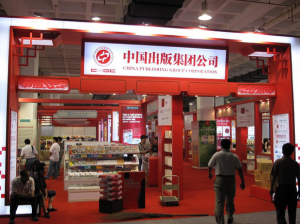 • The Beijing International Book Fair (August 30 through September 3) reflects China’s booming digital publishing business with 2,000 sq. meters of digital exhibits. • Sales of ebooks, downloaded games, apps and other digital content in China hit 80 billion RMB ($11.8 billion) in 2009. UPDATED 8/29: Our initial statistical information stated that the $150bn applied exclusively to the book market. Instead, this figure represents a number given by the Chinese government for the overall publishing media market, which also includes games, app downloads, newspapers and all other manner of printed material. Likewise, the figure of $11.8bn initially stated to represent sales of e-books, also includes, apps, games and other downloads. Thank you to Rüdiger Wischenbart for the clarification. The Beijing International Book Fair, running August 30 through September 3, is attracting an increasingly global audience, as the Chinese book market continues to boom. For many, this means digital. Sales of ebooks, downloaded games, apps and other digital content grew dramatically last year, hitting some 80 billion RMB ($11.8 billion) in 2009 – up from 50 billion RMB ($7.35 billion USD) in 2008. It still represents less than 10% of the overall publishing media market, which is valued at just over a trillion RMB (worth $150 billion USD and calculated as including books, newspapers, gaming…nearly anything that is published), according to official numers recently issued by the Chinese government. E-readers in particular have become a hot product. As reported here last month, Shanda Literature Group -– the country’s largest digital publisher -– released heir first dedicated e-reader, the Bambook. In May, China Mobile — the world’s largest cell phone carrier — announced that it was building China’s largest online digital bookstore. The company plans to offer its subscribers 3G wireless access to online publications including digital books, comics, newspapers and magazines — some 60,000 titles in all — and hopes to attract some 200 million users over the next five years. Earlier, in April, China Publishing Group -– the country’s largest traditional publisher — and Shanghai Century Publishing Group also released their own e-readers. In all, the Fair has dedicated some 2,000 sq.-meters out of a total of 43,000 sq.-meters to digital exhibits. Nevertheless, for many, a book fair is still about the books. In total, the BIBF will put more than 160,000 titles on display, representing the publishing programs of 2,000 exhibitors -– nearly half of which will be from overseas (they include Hong Kong and Taiwan as “foreign” publishers). In all, 200,000 people are expected to attend the event. Last year, nearly 1,400 deals were signed at the Fair’s rights center, a number which the fair’s organizers -– China Books Import & Export Group -– expect to be surpassed this year. One group hoping to help boost these numbers is The Chinese Writers Association, which is sponsoring an event for the first time at the BIBF. They are exhibiting the top 100 Chinese literary titles yet to be translated, likely in the hope of striking deals. (It should be noted that the Chinese Writers Association is itself a government-sponsored body and refuses membership to all dissident or independent voices). Among those with a dissenting view of the “top titles to translate” are likely the writers and editors who make up Paper Republic, a group of English-language translators who will also participate in the year’s fair. (You can browse their website for recommendations). India is this year’s Guest of Honor and is bringing around 30 publishers to the Fair. The Netherlands and South Korea follow as Guests of Honor in 2011 and 2012. For an overview of events in English, click here (though be careful, the page is only compatible with the PC-based Internet Explorer and will lock up your Mac). Translator and writer Bruce Humes offers a good overview of some of the authors being featured at the BIBF. And come back to Publishing Perspectives for more reports and images from the Fair over the coming week. DISCUSS: Is China a Genuine Opportunity for Western Publishers?